This library has been written to support the Maxim MAX11210 24-bit A/D converter as peripheral of the Spark module. Spark libraries can be used in the Spark IDE. The code snippet below shows how to add the high resolution A/D converter to the example for measuring the temperature. In a second example the configuration settings of the MAX11210 are changed by sending commands through a function of the Spark module. // System level calibration should only be performed when a zero-scale signal can be presented to the ADC. // Give a rate command afterwards to reinitiate conversion. // System level calibration should only be performed when a full-scale signal can be presented to the ADC. Both examples can be found in the example project dual-tmp36.ino provided with this library. See my Github repository for the source code and additional information: github.com/bankrasrg/maxim-max11210. 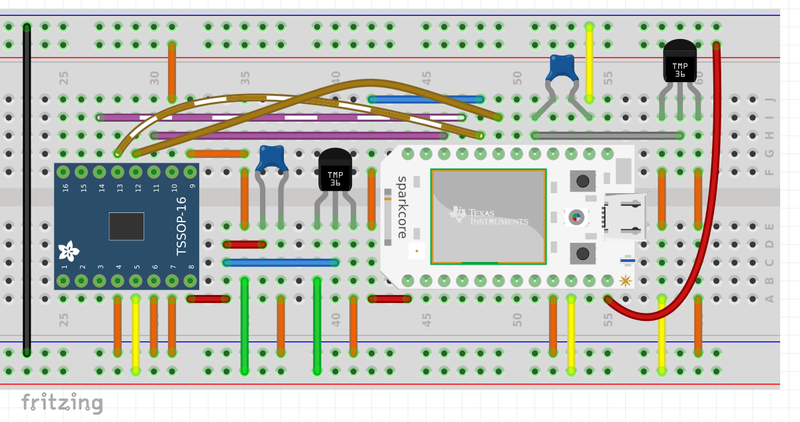 This entry was posted in Electronics, Programming on August 18, 2014 by radko.